Fen’s third work, without giving up on a single soul-shattering, sorrowful shudder, tightens the nuts and bolts of its textured compositional scaffolding to achieve a starker mood. The more blustery side of their musical architecture is emphasized and the keyboard flourishes are wiped off: the murky, grey landscapes of Epoch are swept off by cold winds and the skies are now crispier, vaster, emptier, achieving exceptional results. The level of skill and expressiveness have risen dramatically, the sound is cleaner yet dynamic, reminding me of a great bonfire in a cold, moonless night. If black metal is undoubtedly its soul, the post rock dimension is Dustwalker’s beating heart filled with dazzling, beautiful melody. The Watcher’s voice, one of the most recognizable around, becomes central protagonist: his moans, sighs and desperate, lacerating rasps work powerfully and at unison with the haunting guitars, icy and yet filled with yearning, catching the tragic essence of the human condition. 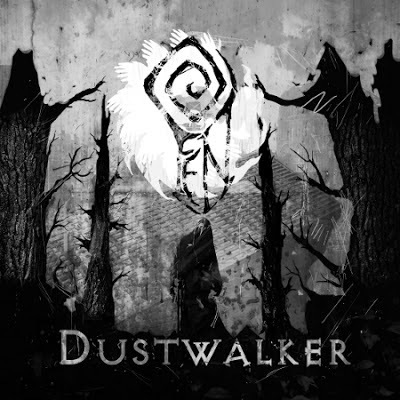 The album opens with a sudden blaze: “Consequence”, with its quintessential Agalloch moments, could describe man’s last regretful moment before its demise, and from then on Death will sit at the center of Dustwalker’s tale. Fen face its drama without any anger or self-hatred. Realism takes them to a painful yet brave path where regret and sorrow have only sense if they eventually lead to restoring self-dignity. “Wolf Sun” may even show a glimmer of hope, even though perhaps in vain... Incidentally, in the stunning graphics by Grungyn, each track has its own symbol: “Wolf Sun” is not just an anthem but happens to have one of the most powerful symbols I have seen of late and it will implicitly speak to the pagan hearts. “Hands of Dust” is swept by some shining psych-rock à la Solstafir, while “The Black Sound” and “Walking the Crowpath” fly a black metal flag caught in stormy, darkly epic winds. Never once the more intense and aggressive tracks shift into Wodensthrone’s typical density, capturing instead a truly perfect balance which sustains the whole album, from the fast-paced parts right to the mellower interludes. Speaking of which, the softer folk-tinged “Spectre” sees The Watcher’s clean singing on top form, hinting at his great performance on the imminent De Arma debut. Out from today on Code666/Aural Music.